Presidential candidate Mitt Romney has attempted to make his philosophy about how to improve American education widely known and easily accessible in recent weeks. But he hasn’t answered many specifics on the campaign trail. The Hechinger Report spoke with Jim Peyser, a member of Romney’s education team and a partner at the NewSchools Venture Fund, to find out more. Peyser also served as an adviser to Romney during his years as Massachusetts governor. ESEA will likely be reauthorized under our next president. (Republicans and Democrats alike have criticized the current iteration of the law, the No Child Left Behind Act or NCLB.) Under a Romney administration, expect the focus to be “more about taking things out than putting things in,” Peyser said. Romney has already said he would eliminate the No Child Left Behind requirement that core classes be taught by highly qualified teachers. This portion of the law defines a highly qualified teacher as one who has a degree in the subject area he or she teaches. Peyser said a Romney administration would retain NCLB’s focus on assessments and accountability for schools and districts, but would likely minimize the consequences for schools that fail to meet standards. 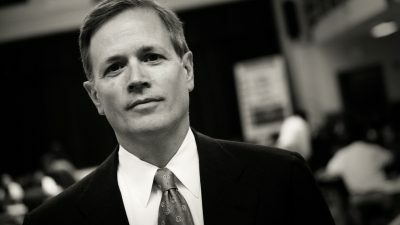 Although Republicans commonly criticize President Obama for not being tough enough on teachers unions, Peyser acknowledges that – especially with Romney’s goal of avoiding new mandates – a Romney administration would be limited in how it could enforce changes that some teachers unions balk at – such as new teacher evaluations or tenure reforms. Work rules for teachers are typically controlled at the state or local level. That doesn’t mean there would be no role for Romney, though. “The federal government can do things that either reinforce or provide incentive one way or another,” said Peyser. Peyser also added that Romney would support the development of more charter schools, which often operate outside of union contracts, and that he would use the bully pulpit of the presidency to get his message across. Increased school choice has become a signature issue for Romney – and the entire Republican Party. Romney’s white paper on education calls for putting more power in parents’ hands to choose schools for their children. Yet, while parents care about academic quality, they might have a hard time evaluating it, Peyser said. An important component of expanded school choice would be having “information that is not only easier to get, but easier to understand,” he said. “That’s only half of the equation,” Peyser said. “The other half is you have to have something to choose from.” Building up these quality options will take time. “It’s not a magic wand solution,” he said. Peyser said he didn’t know just how small we could expect the department to be under Romney but said it would certainly shrink substantially. One likely target for cutting or elimination would be grant programs run through the federal government. Many were created decades ago and have narrow requirements and focuses, according to Peyser. “There is a huge opportunity for both a lot of consolidation and elimination of those programs that should have a pretty significant impact on the scale of the federal Department of Education as well,” he said.